Oh dear, how cringey was that title? I couldn’t think of anything else okay! Firstly, I want to apologise for the lack of posts last week. Lets just say stress levels are at an all-time high and unfortunately the blog becomes the last thing on my mind. I’ve tried my best to plan the following weeks ahead and hopefully have more consistent posts up for you all! (I’ve set myself to post EITHER on Monday’s or Wednesdays). Right enough rambling, on to my tips for becoming a morning person. 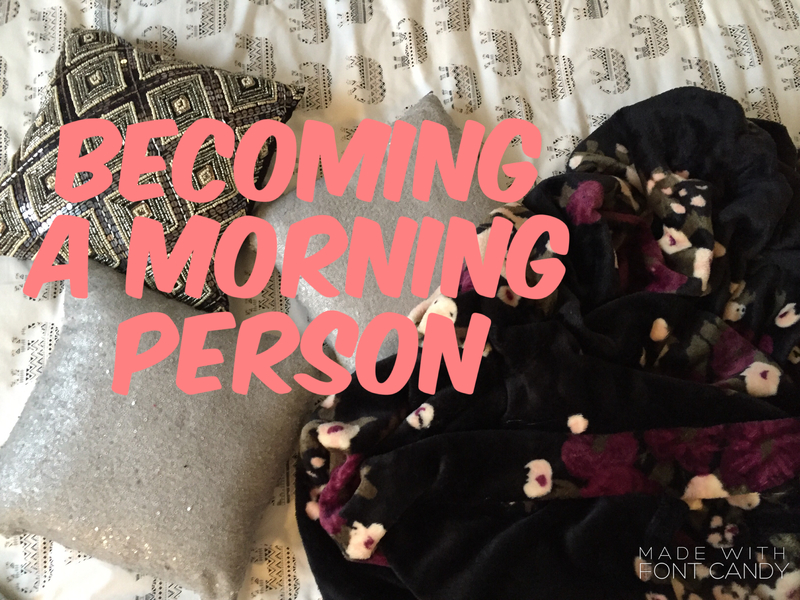 Although I didn’t have set goals for 2016, I knew I wanted to make a conscious effort to be more of a morning person, and I feel I’ve really nailed it and it’s only March (check me out!). DISCLAIMER: I will never be that person who wakes up at 5/6am, but I’ve made a conscious effort to start getting up around 7:30/8 everyday. There’s only so much ‘How to become a morning person’ Youtube videos and blog posts you can read, the truth is, although these tips help me, they might not necessarily help you, becoming a morning person is all about finding your own personal routine that works for you. Nevertheless, I hope this post fills you with inspiration to tackle the horrible mornings! This may seem like a given, but it’s SO important. You don’t need me to tell you that, getting to bed late will kick start you into a bad habit of wanting to get up later. Once you get yourself into a routine of getting to bed earlier, you will feel more refreshed in the morning and more able to have a productive day. My curfew for bed is 11pm or before! Any magazines, health articles and google threads alike will tell you turning your laptop, phone etc on a dim brightness is key to having a good night sleep. You’re less likely to be straining your eyes and more likely to fall to sleep quicker. Since I’ve updated my phone it has a ‘night shift’ setting which automatically adjusts your brightness according to the time of day and thus enabling you to have a better sleep. This has honestly been working and I’m falling asleep much easier. During school I would have my alarm set on the loudest, annoying alarm to wake me up in the morning because I wouldn’t wake up any other way. But since my stay at home gap year (blog post coming soon! ), I haven’t got the need to wake up at 7am (thank God) for school, but this leaves me more likely to hit the snooze button and carry on sleeping. Now, my alarm tone is a calm, soft tone which slowly gets me up in the morning and honestly it helps me get up from my sleep instead of literally leaping out of bed because of my thud of an alarm! – I’ve set mine to twinkle on my iPhone. I’m all for planning, I mean to be honest there are often times where I’m surrounded by an abundance of to-do lists and it’s sometimes difficult to allocate things to do each day because I have no idea where to start! I often have things to do with the blog (taking pictures, drafting posts, schelduling) and my revision schedule too so I’ve started to make a conscious effort to plan realistic to-do lists for the day ahead and make it my aim to allow myself to have a balance between my work and the blog, and to tackle the hardest things on my list first to get them out of the way and I feel more able to get through the rest of the list. Although there’s mornings where I turn my alarm off and lay in bed on my phone scrolling through insta or watching youtube videos, I try to get up as soon as my alarm goes off (it’s hard but I try!) and as quick as I can I set my bed all neat! This stops me from feeling the need to get back into bed and sleep for another 5 hours. I’ve spoke about my skincare routine a few times on here and even though there are nights where I cannot be bothered for cleansing or looking after my skin, the nights I do, I feel so much better and it helps me to wind down before bed! And of course, lighting candles is a MUST and curling up and reading a book – nailing that winding down before bed is essential. Reward yourself for a productive day by allowing some time to relax before bed, you deserve it. This quote has been floating around instagram for quite a while, but its TRUE. We are all guilty of complaining that ‘there’s not enough hours in the day’ but if we start our days earlier we can get so much more done. Although, I’m on a gap year any appointments or outings eg, doctors, seeing sarah etc, I try to schedule them in the morning. Having something exciting to look forward to when you wake up will make you WANT to get up. Once you get into the mindset that it IS possible to tackle your endless to-do list, you will feel more motivated in tackling it. I’ve started to make a more conscious effort to drink more water and cut out fizzy drinks from my diet, I’m not saying wake up and drink 1L of water straight away, but one glass of water when you wake up will make you feel so refreshed and more awake! Now, I don’t mark myself as the ultimate happiness morning person ever, but I am trying. There’s no way I can wake up on a Monday beaming and smiling and singing, there’s just no way. But these tips have helped me tackle waking up in the morning and in turn being more productive. Are any of you morning people? I really need to take in these tips – I’m really not a morning person and find it such a struggle to get out of bed most days. Getting to bed earlier is a must!